I apologise to the Saturday evening concerts in the Pakkahuone and Klubi: Papanosh & Roy Nathanson & Fidel Fourneyron; Colin Stetson & Sarah Neufeld; Ginger Baker Jazz Confusion; and Magnetic Ensemble. All great musicians but after a ‘Thinging’ afternoon, I found myself drawn to the Telakka bar and the Finnish musicians playing there. I got too comfortable and I just couldn’t drag myself away. There. I’m sure I wasn’t missed and even if they don’t forgive me, I suspect I was never on Mr Baker’s Christmas card list anyway! 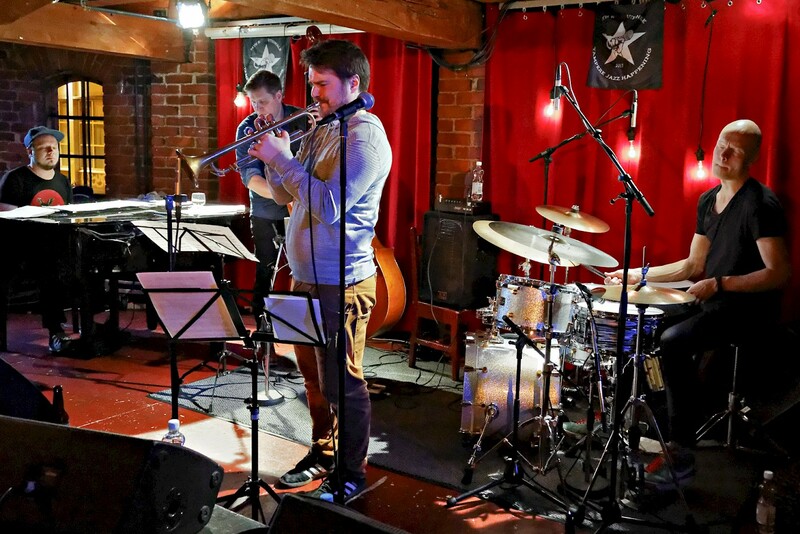 I hate to generalise but I’m going to… if there’s one common feature in Finnish jazz for all its wide variety, it’s possibly that whatever the style or genre, there’s always a little twist to it; some indefinable edge or alternate perspective. Here we have the classic piano trio format but certainly not an ordinary piano trio. 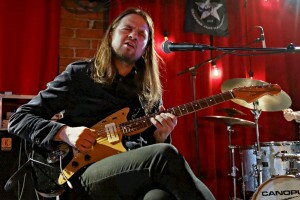 Fredriksson begins with a calm deliberation, doling out the notes with no particular urgency, a mood of steady introspection with touches of almost-but-not-quite dissonance lurking at the periphery. Huhtala and Kallio unhurriedly join in, easing us into the first of three highly distinctive flavours in the Telakka bar this evening. 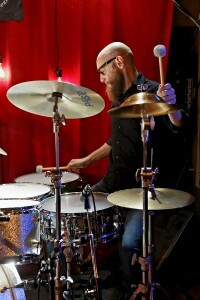 I think Mika Kallio is kind of the ‘mad professor’ of the drums. In his solo work, he mixes a huge variety of disparate percussive ingredients for very experimental (and satisfying) results. Here, in a less ‘out there’ setting, his brushwork is fluid and relaxed with an easy precision, full of subtle embellishment. Just one song in, Kallio takes an extended solo. I’ve seen him in the past with a much more ‘bells and whistles’ kit (literally) but he makes this relatively stripped-down array sing and moan – it’s not the toys, it’s the player! Back to the piano lead, there’s a sense of almost Monk-ish playfulness. Standards are quoted but always with that alternate perspective that creates a very fresh cliché-free experience. Very tasteful but never bland, as a unit, the Jussi Fredriksson Trio were a new experience for me. The next day, I was at the Digelius stall buying the CD, “?” – does that count as an endorsement? Tuomarila makes heavy use of that bell-like bubbling Fender Rhodes-ish tonality to create a very 70s progressive vibe and Kämäräinen’s blues-rock guitar tone is right there with him. I’m hearing King Crimson, Focus, and definitely Pink Floyd. After a particularly referential medley, Kämäräinen wryly notes, “That’s a pack of quotes, for sure.” At the same time, the arrangements and playing also stray into more abstract territory, even ambient at times. It’s uncategorisable and a great set. Looking forward to hearing more of Skinny Jenny. It’s been six years since I was last in Tampere for the Jazz Happening and I’ve missed out on a lot of great music in that time. This year’s programme is particularly excellent but if I had to point to one group that made me decide this was the year to return, it would be the Ilmiliekki Quartet. I hate to seem like a gushing fanboy but I saw them here in the Telakka in 2004 and I still often listen to their two albums regularly (Dear TUM Records, where oh where is album #3, please release it soon!) I have to admit that I was looking forward to hearing some old favourites live – “ICO”, “Old May Become New”, “Askisto”… – but as ever, Ilmiliekki confounded my expectations and played only the new material, and you know what? I didn’t miss the old. As ever, the compositions are mature, unpredictable, full of subtlety, strongly melodic, instantly memorable and simply quite moving (including a gorgeous arrangement of Queen’s “All Dead, All Dead”). Pohjola fully deserves his burgeoning reputation as a world talent; I’ve heard him play in a few different scenarios over the years but I think that his most sensitive and evocative side is brought out in this company. Lötjönen is both steady and subtle with a sense of unflashy delicacy, truly a player in the service of the tune. I’ll admit that Prättälä is unknown to me outside of Ilmiliekki, but he brings a beautiful sense of ‘ripple and flow’ to every composition this evening. Finally, Louhivuori is possibly the most eclectic in his non-Ilmiliekki adventures and in this ensemble, it always seems to me that the diverse rhythmic touches and accents make the drums a lead instrument alongside Pohjola’s trumpet. Despite the fact that these four don’t play together so often anymore – busy as they are with what seems like dozens of solo and other projects – that telepathic communication remains, a single unified whole that had a packed venue hanging on their every nuance, right down to the last barely audible note, lost in wonder. I liked it. But then, I knew I would.